My mom was here visiting last week and it seems like all you do when company comes is eat. Don't get me wrong, we ate a lot of great food, but eating out can be a slippery slope. There is a lot more temptation to eat something "bad" when I am outside the comfort of my own kitchen. I don't really do cheat meals, or cheat days, I find it's easier to stay in control without them. That being said, I did eat a brownie hot fudge sundae on Saturday, and it was LEGIT. We went to a little town north of SD called Orange. This is Orange proper, not just Orange County. The town is a throw back to the 1950's, and as such, has a great 50's style diner. What do diners serve? Shakes, malts, root beer floats, and brownie sundaes. It was a once every 6 months type of thing, don't judge. The sundae did get the little cogs in my brain turning though, to try and come up with a brownie recipe that would satisfy the desert cravings, without all the guilt. Brownie recipes in general bore me, so I wanted to spice it up a little. Literally. Chipotle and chocolate are a match made in foodie heaven. My mom thought these were a little spicy for her taste. As always, feel free to adjust the spice level based on your taste buds. I used canned chipotles in adobo sauce, but you can also use dried chipotles or chipotle pepper from the spice aisle if you don't want the canned. The amount needed will vary depending on what you use and how spicy you want to make these. 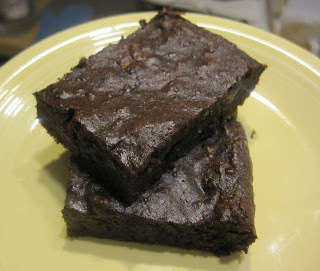 The texture comes out somewhere between brownies and fudge and that was more than ok with me. In a small bowl, cover chopped dates with warm water and let soften for 15-20 minutes. Drain. To the bowl of a food processor, add dates and pulse a few times to break down. Then add almond butter, cocoa powder, maple syrup, and chipotles, turn processor on until well combined. In a mixing bowl, whisk eggs, vanilla and a pinch of salt. Add date mixture to eggs and mix until well incorporated. Fold in chocolate chips. Spread mixture out in 8x8 baking dish, lined with parchment paper. Bake for 15-18 minutes or until a toothpick comes out clean.